It's always nice to eat well. Here is an idea for a good lunch - tagliatelle with shrimp sauce. The entire meal is cooked in less than 30 minutes, including preparation. For the tagliatelle - put water in large pot, add a good amount of salt and bring it to the boil. Blanch the tomatoes, peel the skin and finely chop them. Finely chop the celery into small cubes. Very finely chop the spring green garlic. Remove the seeds from the chilly peppers and very finely chop them. Put the tagliatelle in the boiling water and reduce heat so they cook in sync with the sauce. On another burner, put a large pan with olive oil on medium-high heat. Once you start putting ingredients in the pan, things are going to happen quite fast. Put the onion in the pan, and let it cook, stirring from time to time. When the onion is half way cooked, put in the garlic, stir a couple of times and add the celery and the peppers. Season with black pepper, allspice and salt. Let everything in cook for a couple of minutes while stirring, then increase the heat to high. When the vegetables are starting to caramelise, add the shrimp, stir in with the vegetables and add a little more seasoning. Let the shrimp turn white and curl up on themselves, while stirring from time to time for the shrimp to cook evenly. 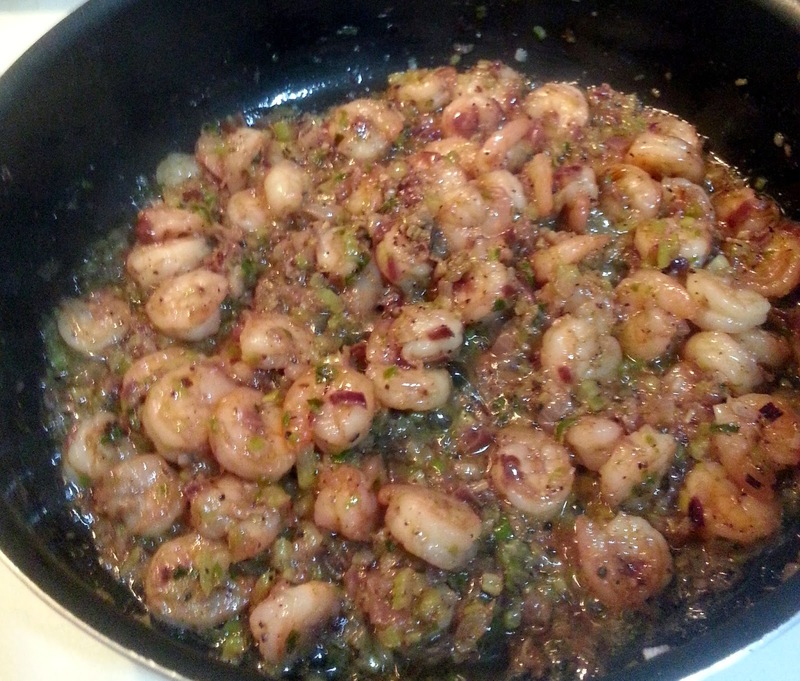 When the shrimp are cooked, add a teaspoon of butter and a good swig of brandy, stir it in and reduce the heat to medium. When the butter melts, add the tomatoes, stir well and reduce the sauce over medium heat. 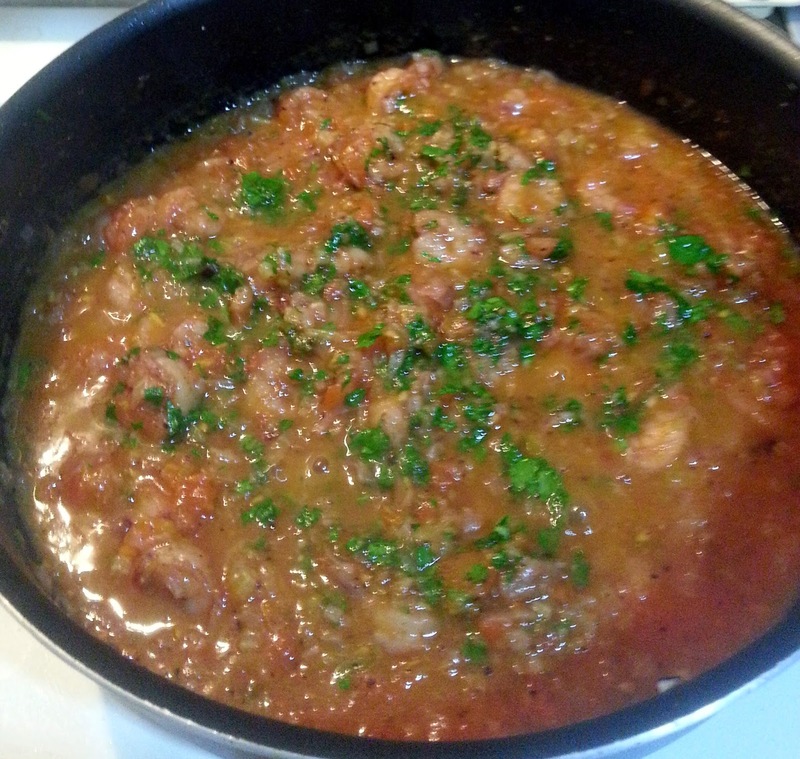 When the sauce is reduced, remove from heat and add chopped parsley. When the tagliatelle are cooked al dente, drain the tagliatelle and add the tagliatelle to the pan with the sauce, and stir them in the sauce over medium heat. Serve immediately. Like the recipe? Tell us in the comments and share it.